We spend a lot of time here touting good ideas. And while we believe in positivity, there’s also value in looking at occasional “how-not-to-do-it” examples. Welcome to our first Marketing Misstep. Consider this like a history lesson: learn from others, so you don’t make the same mistake. Enjoy, and feel free to laugh… we did! Recently, a team member stayed at a Hampton Inn. 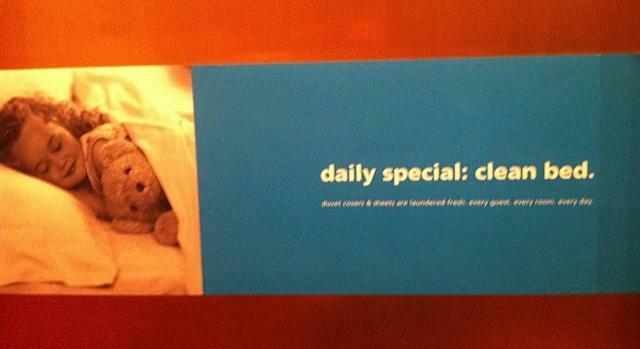 Plastered in the elevator were graphics boasting that duvet covers and sheets are washed fresh for every guest. 2. Finally, I can sit on my bed naked without worry! Of those we polled, #1 was the most common response. What does that say about their campaign? Cleanliness is a table stake–the bare minimum you must meet to compete. Look at airlines: Southwest doesn’t boast safety… that’s a given. They go beyond that, promising low fares and high spirit. By choosing to highlight fresh sheets–something people already expect–Hampton Inn loses an opportunity to stand out in the sea of hotel chains. Have you ever met a teen concerned with a clean hotel bedspread? Didn’t think so. The first image speaks easily to parents who are concerned about clean sheets for their children, the second is a big stretch. It’s not enough to brag about the basics. Your brand lives in every. single. detail. So identify your table stakes… then push past them. Send us to SXSW Eco 2015! Newsflash: We are B Corp Certified!